A magnificent 2,300 acre community set among natural preserves and exquisite lakes. The Country Club at Mirasol, a private, gated country club community with 25 diverse villages, offering private family residences ranging in price from the $400s to over $4 million. It was awarded Platinum distinction as one of the finest clubs in America. A wide selection of premium homes offer golf, waterfront, and natural preserve settings. Mirasol has over 350 homes with children and is a very active community. Click here to see all homes for sale in Mirasol. At Ibis Country Club, you're sure to find a home that fits your lifestyle. Ibis currently offers you fifteen different neighborhoods to choose from, featuring an exquisite collection of state of the art residences, Florida-contemporary villas and single-family homes ranging from the $200's to over $3 million. Click here to see all homes for sale in Ibis. Ballen Isles Country Club offers luxurious homes scattered around three superior golf courses. Choose from a delightful array of BallenIsles neighborhoods ranging from exclusive estate and courtyard homes to casual patio homes and golf villas. Common to each are professionally crafted details of the highest quality. Above all, each home is a unique statement about the tastes and accomplishments of its owners. Click here to see all homes for sale in BallenIsles. Frenchmans Reserve is a private, gated, golf and tennis community. It is hard to tell if you are living in a planned community or a tropical vacation island. Custom, custom, custom is the word that best describes this gem. Click here to see all homes for sale in Frechman's Reserve. From the beautiful vistas of lakes and greenery, to the elegance of our 20,000 square foot Mediterranean-style clubhouse with it?s cascading water-fall, the outstanding banquet facility at Abacoa Golf Club is the perfect setting for any special occasion. 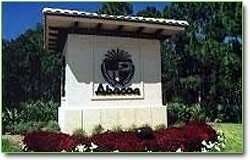 Click here to see all homes for sale in Abacoa. In keeping with a commitment to present a golf program steeped in tradition and created for the "player," the Old Palm golf course has been designed by golfing great and Hall of Fame member Raymond Floyd. Serving as the Club's Honorary Chairman, Mr. Floyd is intimately and personally involved in the design, development and maintenance of this exclusive club and golf course to ensure that Old Palm Golf Club stands as one of the finest clubs and courses in the world. 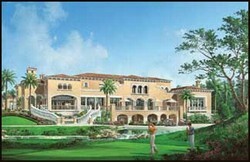 Old Palm Golf Club will be known as Raymond Floyd's home course and will serve as a residence for his family. Click here to see all homes for sale in Old Palm. This resort, which made "Golf Magazine's" 1998 list of "Silver Medal Resorts," has five eighteen hole courses. Jack Nicklaus redesigned the Champion Course in 1990. The finishing holes, #15, #16 and #17, are known as the "Bear Trap," because they all require shots over water. This course is the site of the senior's PGA Championship. "Golf Digest" ranked this course 72nd under the category of "Top 75 Resort Courses" for 1992. In addition, "Golf gazine" rated this course 70th under the 1996 category of "Top 100 Courses You Can Play in the United States." The most scenic hole is #5. The General Course favors a Scottish-links tradition with undulating fairways, numerous grass bunkers, and a common green shared by holes #8 and #12. Water comes into play on sixteen holes. The Haig Course is the oldest of the five courses. Water comes into play on fifteen holes. The Squire Course is a "thinking man's course," requiring many accurate fairway wood and long iron shots in order to score well. The Estates Course is the newest of the five courses and will challenge any skill level. Click here to see all homes for sale in PGA National. Hugging the shores of over five miles of secluded waterway in Jupiter, The Club at Admiral's Cove is an amenity-rich private community for boaters and golfers alike. Admiral's Cove, ranked among the top 4% of America's private clubs in terms of excellence, was selected as one of the Platinum Clubs of America by Club Leaders Forum. Golf is a world-class experience here, beginning with 45 challenging, enjoyable holes designed by Robert von Hagge. 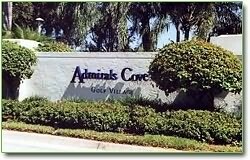 Click here to see all homes for sale in Admirals Cove. In the 1970's, Frenchman's Creek in Palm Beach Gardens was the home golf course of Jack Nicklaus and many other PGA Tour players. Today, the two newly-designed 18-hole championship courses, the North Course by Tom Fazio and the South Course by Bob Cupp, reflect the original, natural beauty that is often compared to North Carolina styling. Lakes, creeks and tree-lined holes create a picturesque setting for challenging games and tournaments. Golfers and residents may enjoy a complimentary breakfast everyday at the Club's 19th hole. The Club is a relaxing "home away from home," offering a delicious array of dining choices, and a Take Out Menu for those quiet evenings at home. At the Beach Club, dinner is served poolside or right on the beach. Tennis is a popular sport at Frenchman's Creek. There are 17 beautiful courts, a stadium court, and a fun-filled tennis schedule. Click here to see all homes for sale in Frenchman's Creek.